The initial release is now available from the Android Market for testing and feedback. The Beta version of TodoToday for Nozbe uses the basic public Nozbe API which provides limited capabilities for managing Nozbe actions and projects. 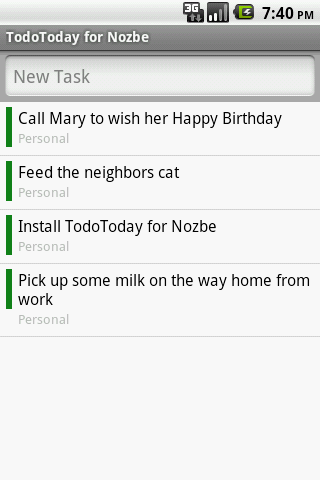 The full release of TodoToday for Nozbe is anticipated to support additional capabilities and features. For adding new tasks Nozbe supports a 'Smart Add' syntax to include key task fields in the task entry text. The Project for the task can be included in the task entry using a # prefix, a Context can be indicated using a @ prefix. e.g. "Call John #Personal @Home ! ".